We live on the edge of the continent; a stone's throw from the Pacific Ocean. Many hours have been logged building sandcastles, chasing waves, searching for mermaids, and collecting treasures! Today's pin it make it utilizes a few of those treasures that have found their way from the beach and into our home: driftwood. Jack is an expert stick collector and when he doesn't throw them back to the waves or let Tucker run off with them, they usually make it into our car and eventually become garden accessories. I have spied a few crafty ideas on Pinterest using beach treasures and I am always keen on crafty things for boys. These are simple to make and one could use a variety of materials for the sails and embellishments. I am always excited to use grommets! I just love grommets! 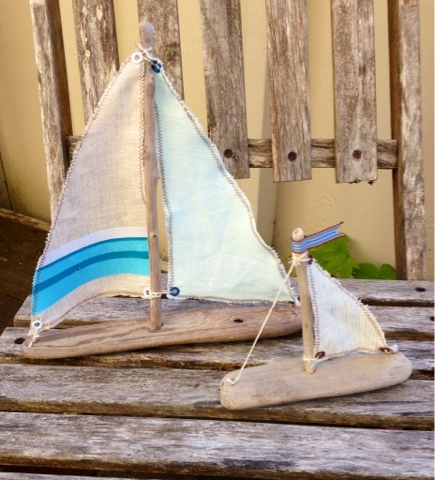 These lovely natural boat creations may even become Father's Day gifts and would be well received by ones who live far away from the seashore.